I am a Food Network junkie. Some days, I wish I was Bobby Flay, the ultimate celebrity chef and my personal food hero. If you watch Food Network, you’ve also heard of Paula Deen, the infamous cook that defines “a little bit of butter” as a whole stick of it. Anyways, Paula Deen is to butter as Bobby Flay is to ancho chili pepper. I swear, he uses that stuff in every dish, but who can go wrong with more chili pepper? Love it. In my quest to find a burger recipe, I came across a highly reviewed recipe for sliders. It was from Food Network and from Bobby Flay. It, of course, has adobo chipotle chilis too. This was perfect complement to what we were whipping up for our lunch party this past weekend. It was big enough to be filling, but small enough that it didn’t dominate the meal. Also, the ancho chili complemented the skewered shrimp and gazpacho dishes we were serving. The sliders are simple. No onions, no worcestershire, and no egg. Just ground beef, salt, and black pepper. The chipotle mayo is what really shines and what makes these slidersy a hit. 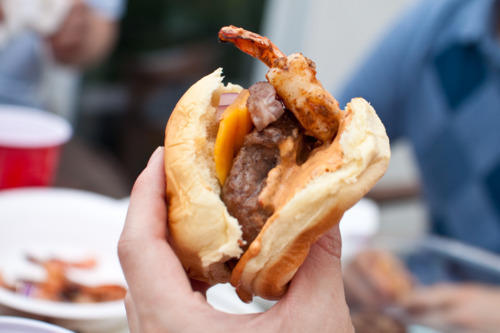 Another benefit of serving sliders is that the cook fairly fast, as they are about half the size of a regular burger. I recommend this recipe, so try it for yourself. Let’s start with the chipotle mayo. Add all the ingredients to a food processor and puree. Season, to taste, with salt and pepper. Start the grill to medium-high heat. For the sliders, form the meat into 2 to 3-ounce portions, packed tightly. Season with salt and pepper. Push in a few little chunks of butter. You can substitute butter for small chunks of cheese for an added flavor. Place the sliders on the grill. Wait until they are nice and crusty on the first side, about 4 to 5 minutes and then flip and cook another 4 minutes. When the sliders are about done, top with desired cheese and close the grill, allowing the cheese to melt. Place the slider on mini burger buns and top with chipotle mayo and any other desired toppings. In the photo above, we threw in some grilled sirloin steak and a spicy grilled shrimp for added deliciousness.